This post was sponsored by Orchard Supply Hardware. All Opinions are 100% my own. A very happy Monday to you all. I hope your week has started off on a lovely note and that this post will make it even better. 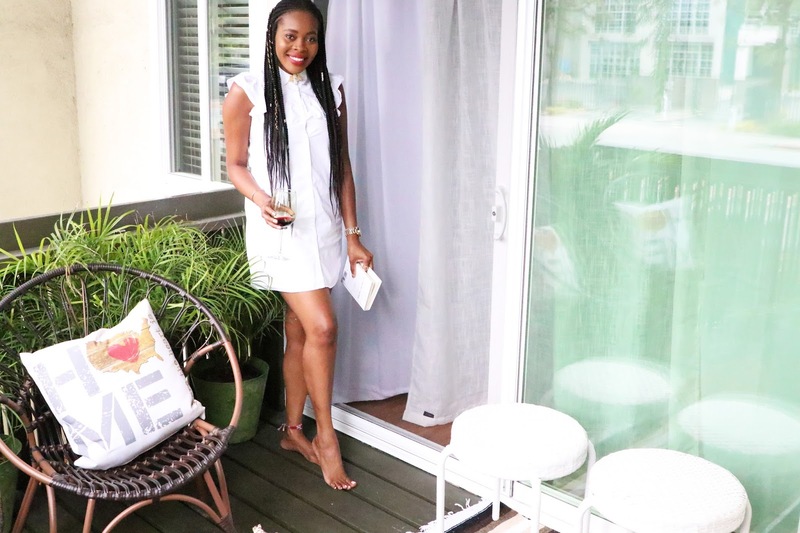 I've been sharing bits and pieces of my home with you all since I moved last year and so for today's post, I'm sharing with you my newly decorated balcony, in partnership with Orchard Supply Hardware. I have been itching to decorate my balcony and since summer is in full effect, I knew I had to do it now. I just returned from my vacation (Tulum) two days ago and I was so inspired by all the textures, fabrics, and contrast I saw in Tulum. Immediately upon returning I went directly to my local Orchard Supply Hardware store to shop the items I knew would be perfect for both my balcony decor, and to sooth the vacation blues. I could list a multitude of reasons why I love Orchard Supply Hardware but here are my top three. One, the customer service is impeccable and incomparable. Two, whenever I am in the store, I literally do not feel like I am in a hardware store. Three, I wanted to make a one-stop to shop for all the items I knew I needed for my balcony decor, and they had everything I needed. With that said, I started off my week one happy gal, skipping the vacation blues, and enjoying my newly decorated space. 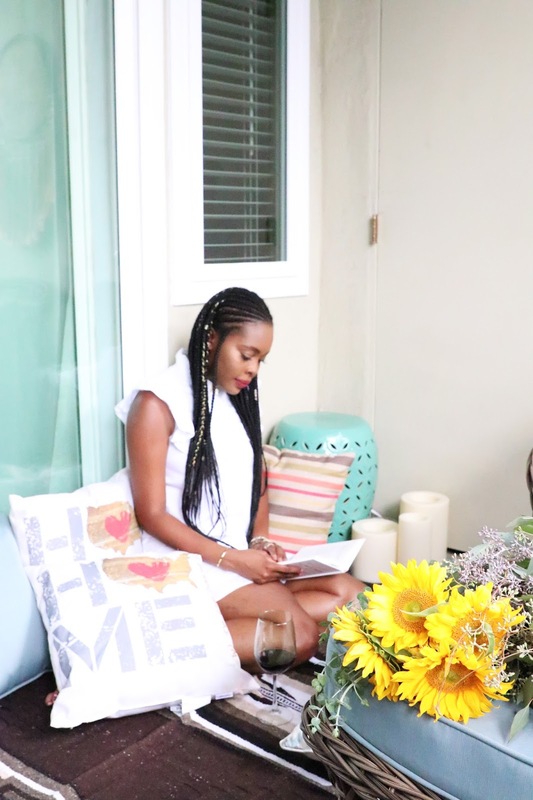 Nothing serves more bliss to my life than the comfort and chicness of my home, my happy space. 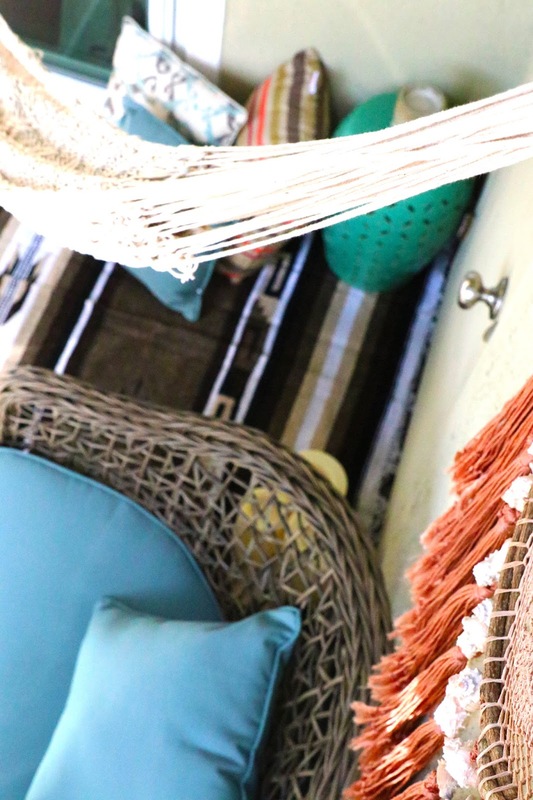 Walk with me as I share how I decorated this chic, mexican-moroccan-boho vibe city balcony. 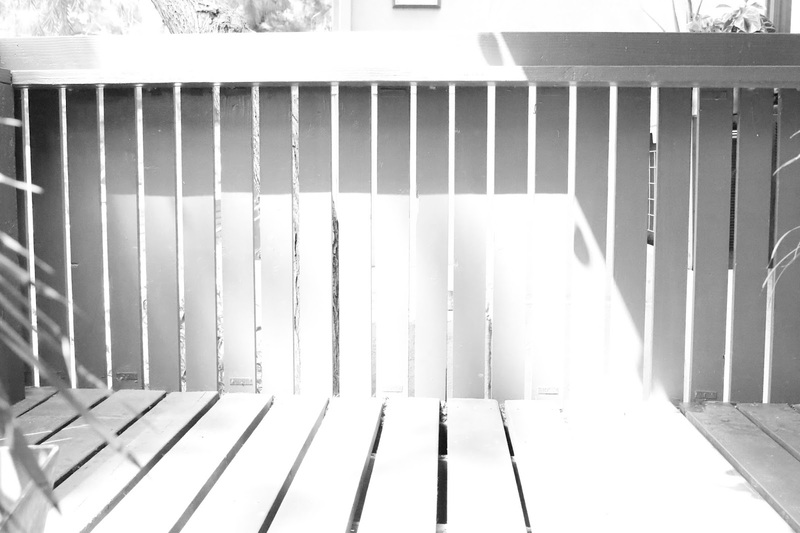 My balcony was pretty much an empty space with a few plants I tried to keep alive but sadly failed. My guy and I did not spend much time out there. Actually our dog Marley (see his little self below) spends most of his time out there. He had the whole space to himself and he frolics around with his toys and owned that space. But oh, no more. It's now a cozy and chic spot ready for entertaining and relaxing. 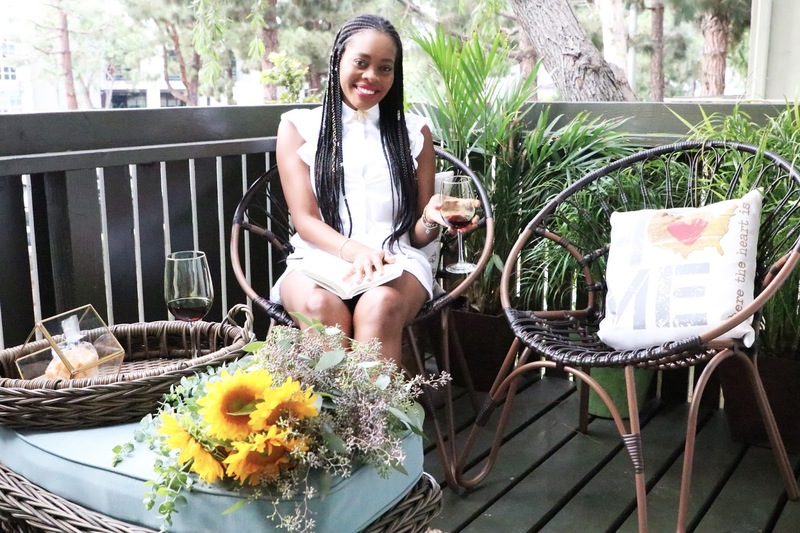 One of my top priorities for my balcony was to bring life to the space. This meant, adding green plants or flowers. 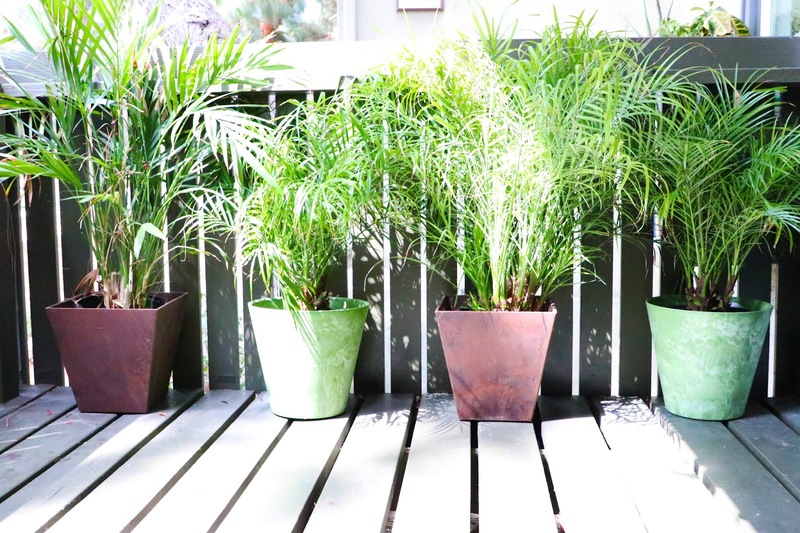 I opted for these thin leaves palms because they are low maintenance, gives a lot of greenery, will grow overtime and provide me with a beautiful privacy screen. I learned so much about my plant selection from the helpful member of Orchard Supply Hardware in the Nursery department. He was so informed, excited about plants, and really helped me to pick out plants that will serve my lifestyle, purpose, and taste. He took his time to find out what I liked, what I was looking for and realistically what will grow and give my space what it needed. The best part, there is a lifetime warranty on my plants. If they die for some reason, I can easily return them, even if I lost my receipt because I have a member account (free and easy to sign up in store). Just look at the instant life of that area (north end) once I added those palms; I also got all four pots. I went with two round green ones and two square brown ones for contrast. Love them!!! 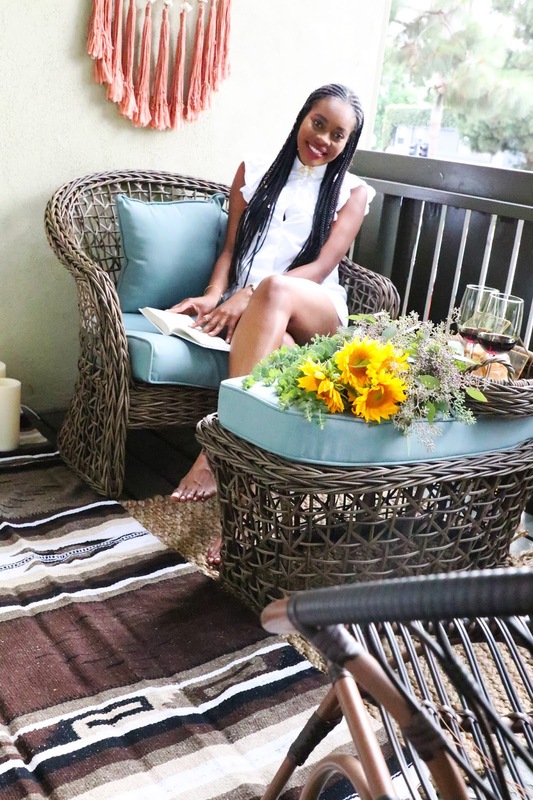 On the south end of my balcony I decided on this beautiful and durable Westport Oversize Chair. It can easily sit one or two people. It goes with this gorgeous and functional Westport Ottoman With tray. I love that is serves as a table and an ottoman for additional seating when we do have a lot of guests. 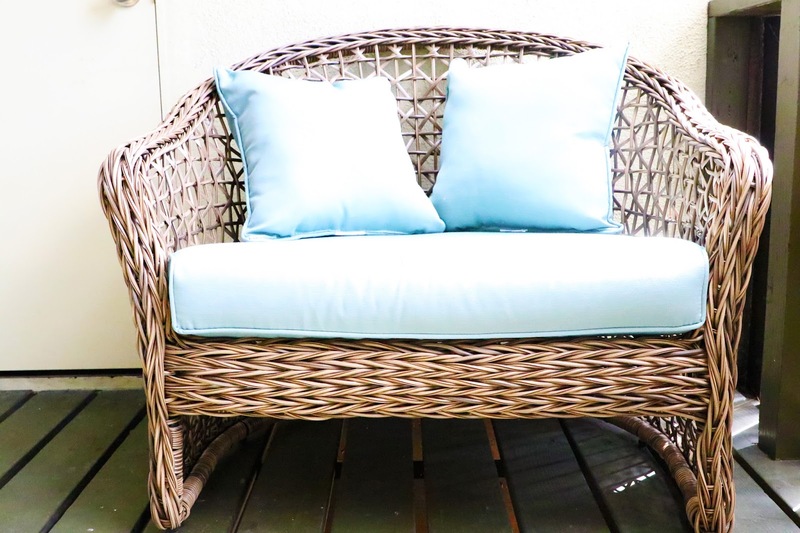 The cushions are very durable and I was informed by the excellent staff at Orchard Supply Hardware that it's easy to clean and the material on the chair is also great quality. I was contented to be affirmed about the quality and durability of what I was purchasing. Next up, I got these two chic Barrel Strap Wicker Chairs in brown. Again, these are extremely high quality, wrapped in aluminum frame and coated with wicker, which will withstand all weather conditions. 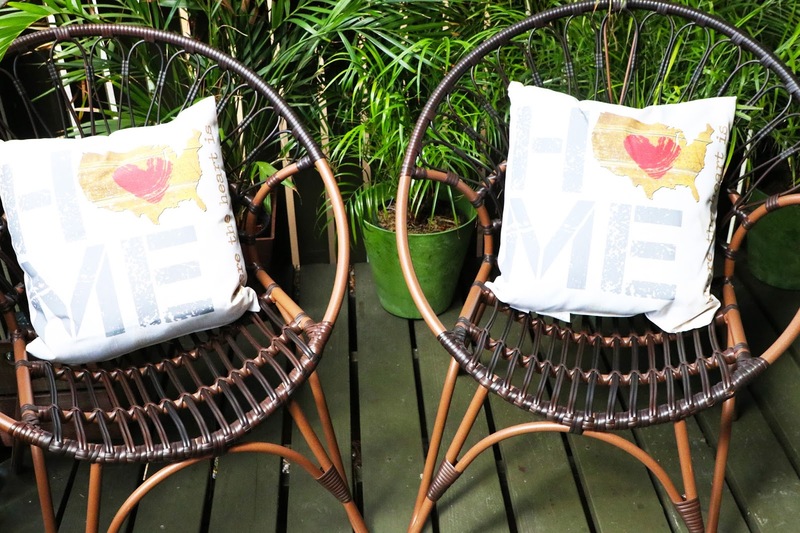 I added these Home Is Where The Heart Is statement cushions and I think they look fabulous. Orchard Supply Hardware has a wide variety of cushions to please all tastes. It was so hard to choose, but I ended up falling in love with these. To add some texture to the space I went with these Tag Braided Jute Rug in Natural. I bought two of them since I figured I could move them around later. They feel so great under my feet and I know my guests will be comfortable too. 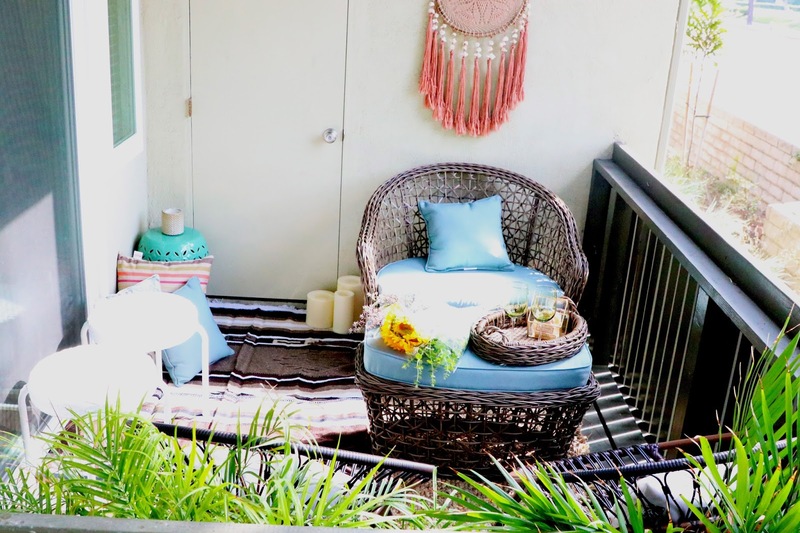 At the west-side of my balcony, I really wanted to infuse a Morrocan vibe and create a space where I could really relax on the floor to a good book, a glass of wine, or playing a game of cards with friends. 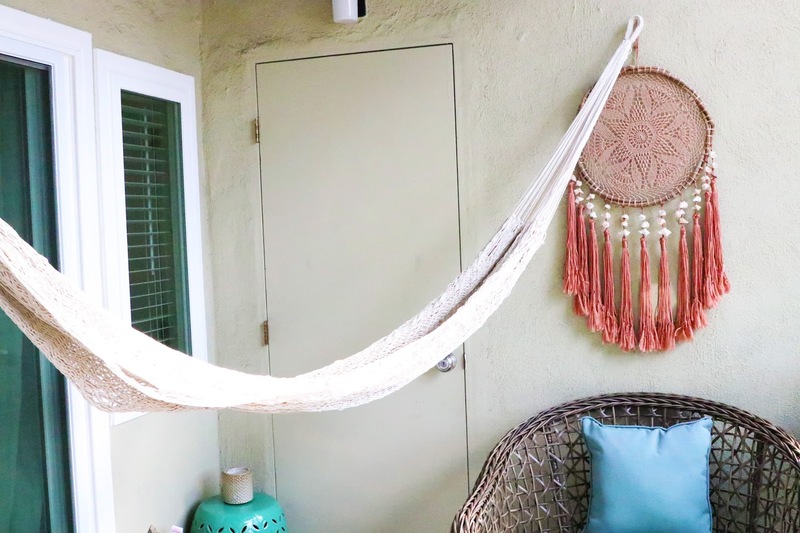 I was so inspired on my trip to Tulum and I brought this serape blanket back along with a dream catcher and a hammock just for my balcony. 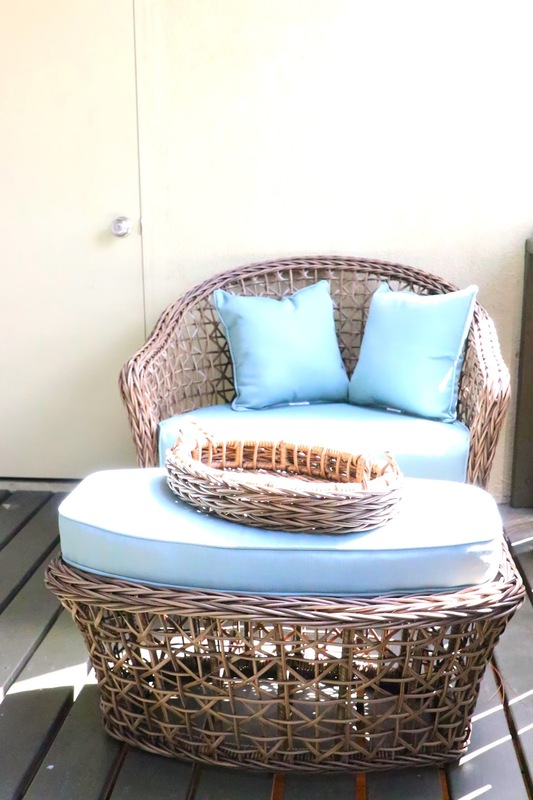 I laid it down, added some more cushions from Orchard Supply Hardware, and this pretty blue garden stool, perfect as an added side table or placement decor. 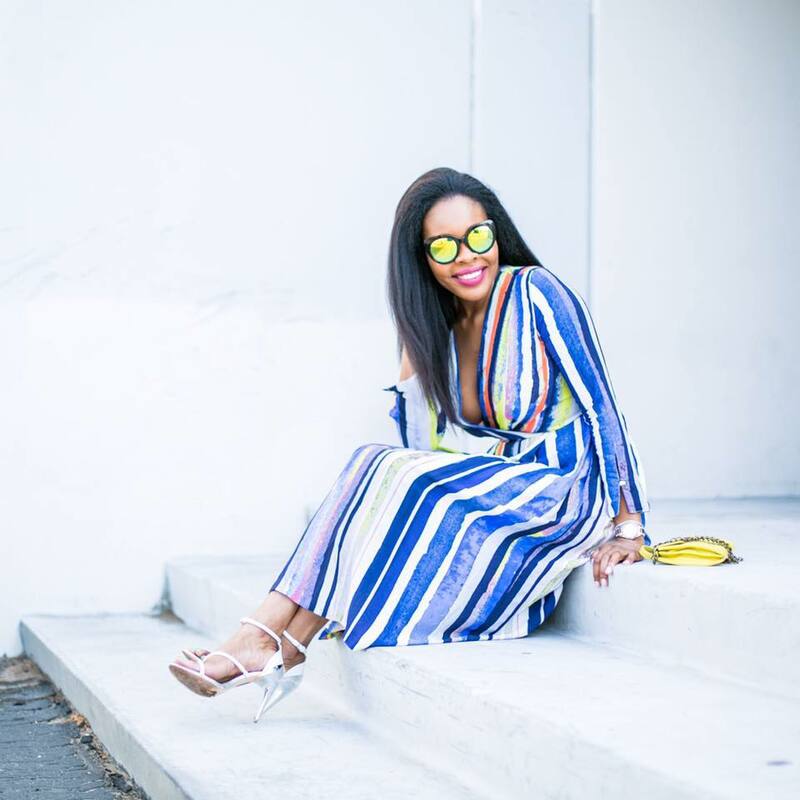 I love the blue, as it gave me the perfect pop of color to my space. 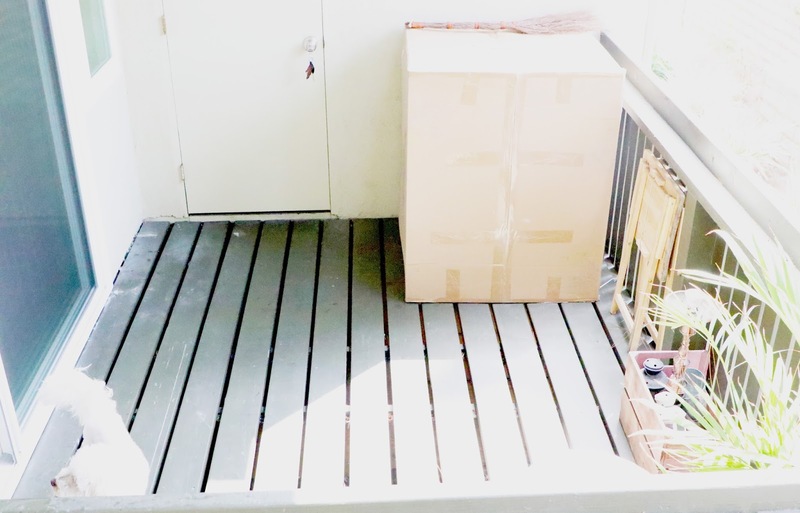 If you've been reading my blog for awhile, you know I love candles and I decided to get flameless candles to be on the safe side for my Balcony. I had to give you a quick view of my Hammock. I haven't gotten the proper hooks for it so it's more decorative as we speak. I intend on going back to Orchard Supply Hardware next weekend to get some hooks for it. Also, how cute is my dream catcher?! Gotta love it. I've always wanted to add string lights to my space. Maybe it's because I love Christmas and it's the best supplement to actual Christmas lights, or maybe it is the romantic vibe it gives. I figured my balcony would not be complete without string lights and best-decision-ever! 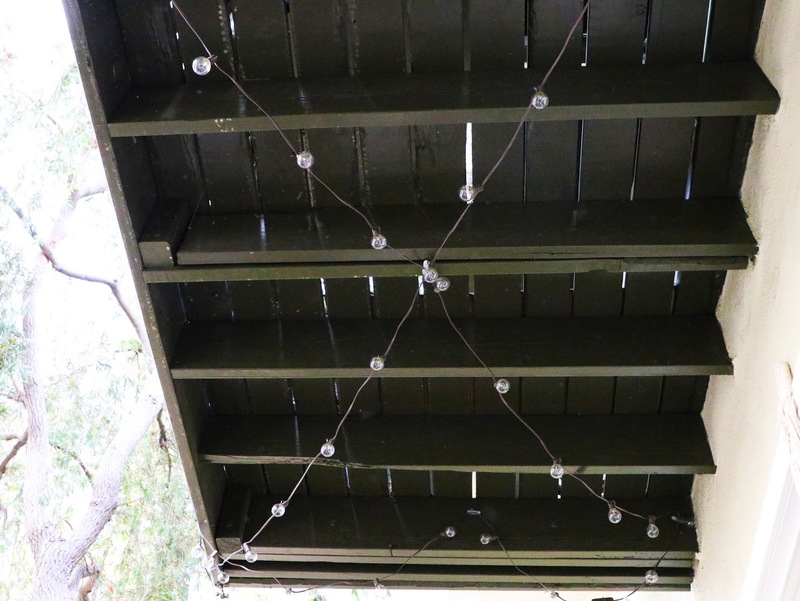 I added two 12 foot lights, criss-crossed them and voila!!! 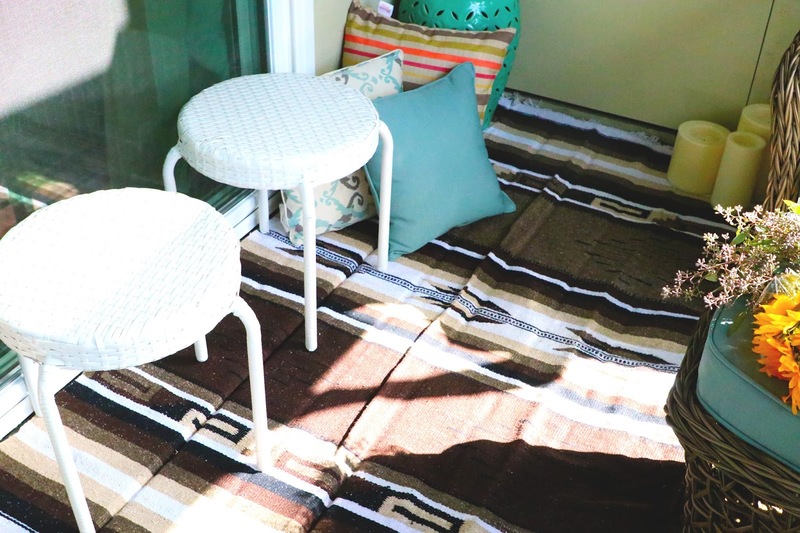 I also added these two cute stools I found while on my way to check out at Orchard Supply Hardware and had to have them. Do you know why? they were also on sale and your girl cannot pass up a sale. I told you, Orchard Supply Hardware was going to be my perfect one-stop-shop. I didn't want to cram my space and I had thoughts of returning them, but decided to keep them because I can easily stack them on top of each other to store and create more space. I absolutely love them. 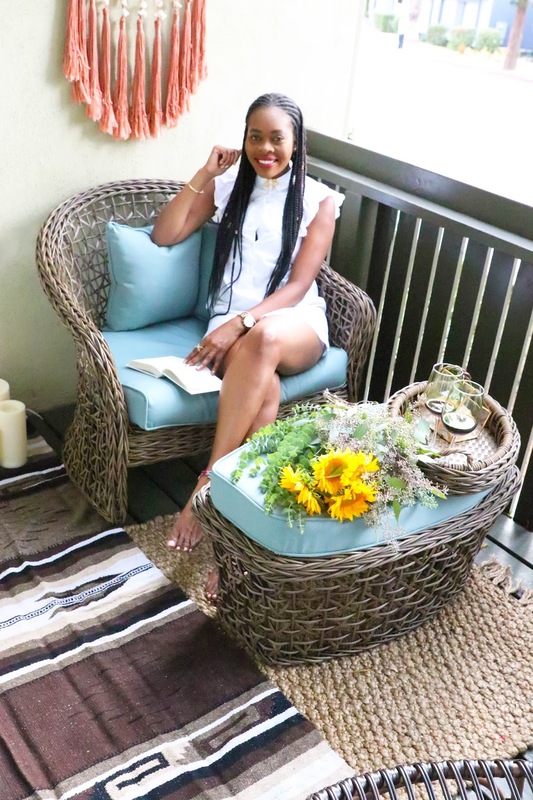 I really hope this post has inspired you to create a warm, cozy, chic, or lavish balcony or patio. It truly will help you to fall in love with your home all over again. You'll also spend much more quality time with yourself and your family. 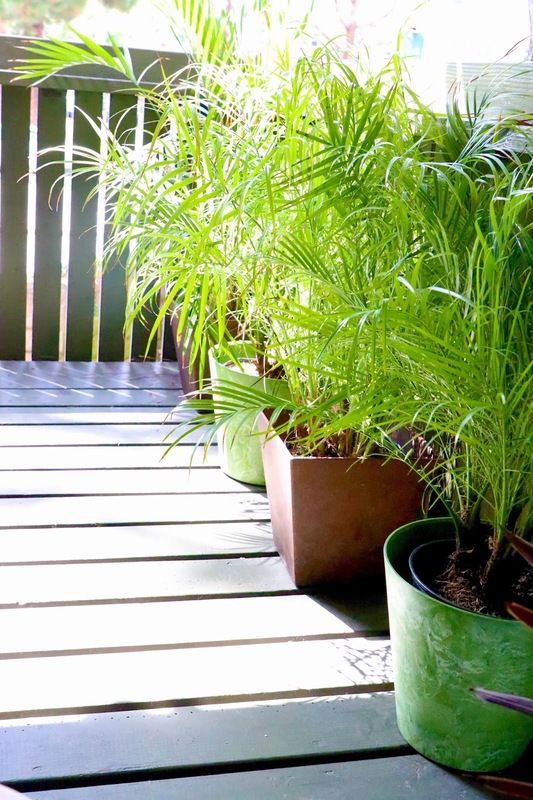 If you have kids, it's also a great way to spruce up your space and encourage them to spend time outside. 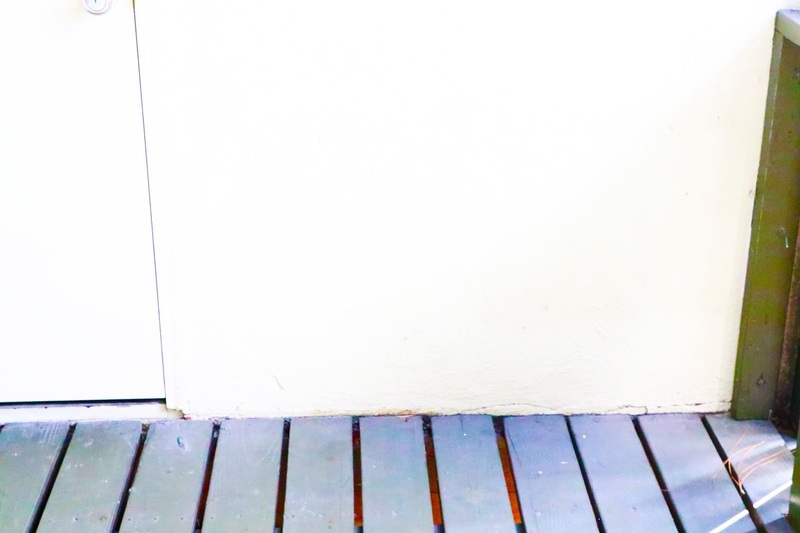 As the weather changes and summer goes, you can easily add a mini heater (they have them at Orchard Supply Hardware) and still be able to enjoy your space all year round. 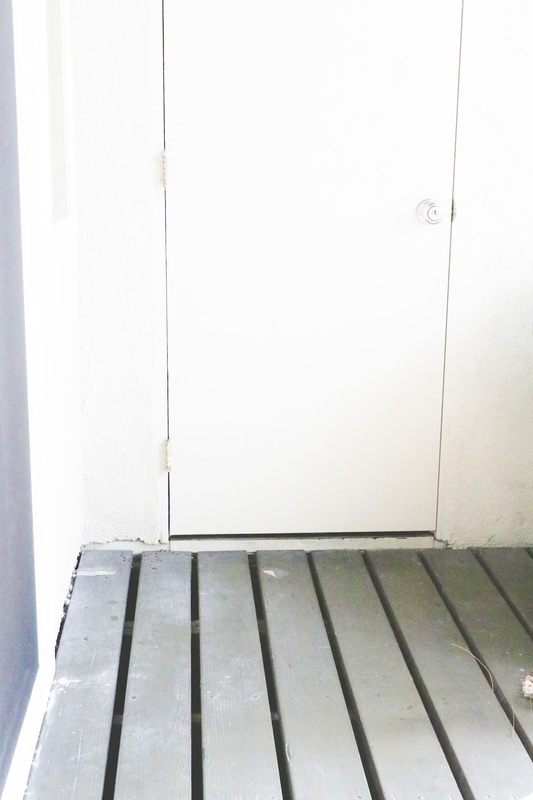 Let me know your thoughts on my newly decorated balcony and if you have shopped at Orchard Supply hardware before. 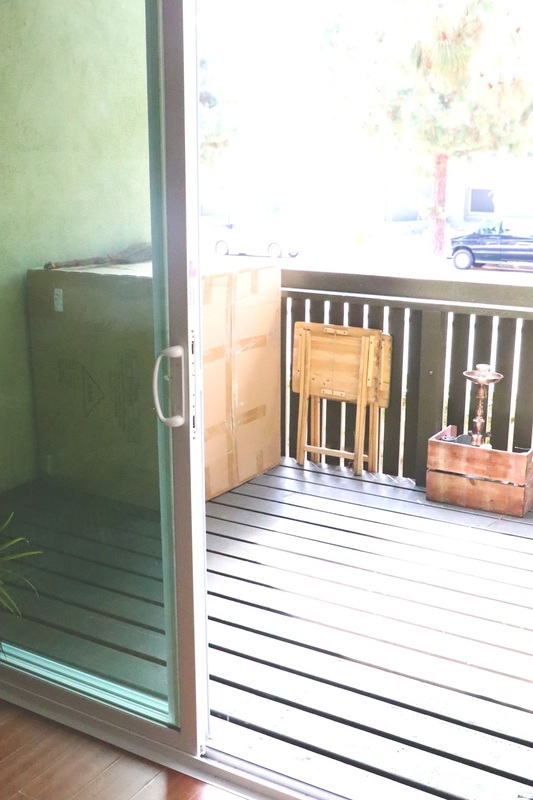 I live in the heart of Los Angeles and being able to have a outdoor space is gold, even if it's a small balcony like mine. I plan on adding some succulents to the space so stay tuned for that. Thanks, Ryan. Hehe yes it's perfect for wine night. 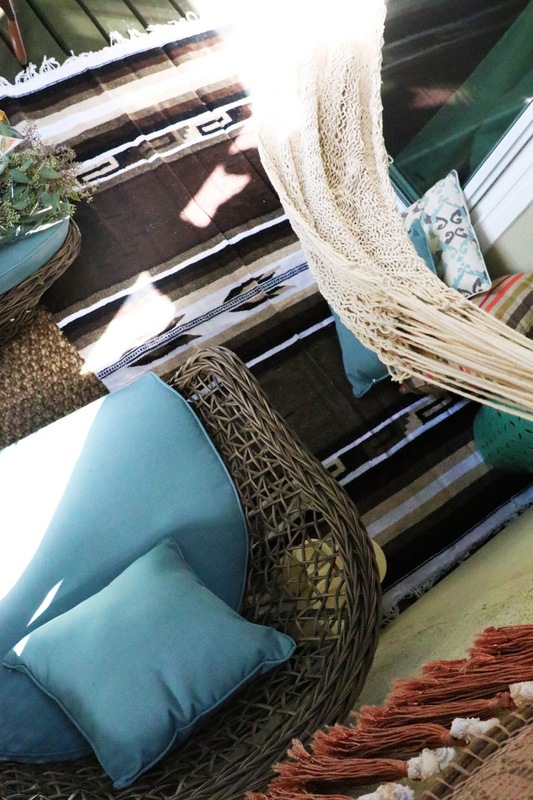 What an amazing difference the decor did for your balcony! Transforming it from a place you didn't use (except Marley the cutie) to a place which is basically like a second living room is quite amazing. :) Great job and lots of inspiration. Now I just need to get an apartment with a balcony, haha. 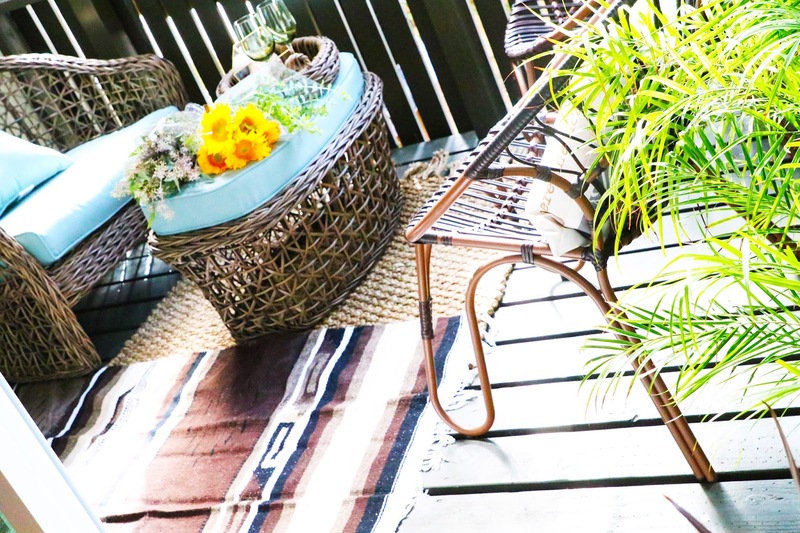 I love the Boho vibe you've created for your patio! The greenery adds such a fresh flair, and the wicker chairs are timeless. This is the perfect decor to entertain guests with. Awesome job, you definitely have created a beautiful space for yourself. Moving could be so hectic but so fun at the same time especially decorating everything! I love the plants you added and the color scheme is so sweet too! I hope you had fun in Tulum! Orchard Supply Hardware has some amazing pieces! 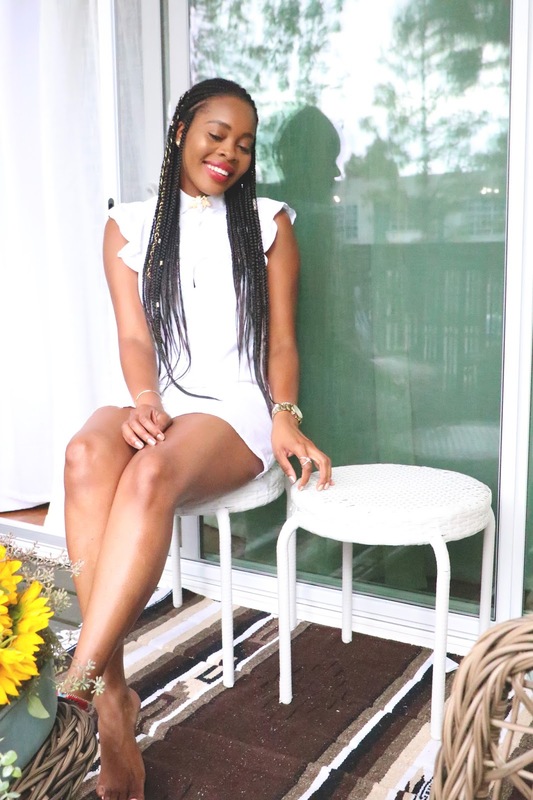 I love this glam boho vibe! I appreciate so many different styles and can be a bit decisive so I just blend them together and stop fussing with it! 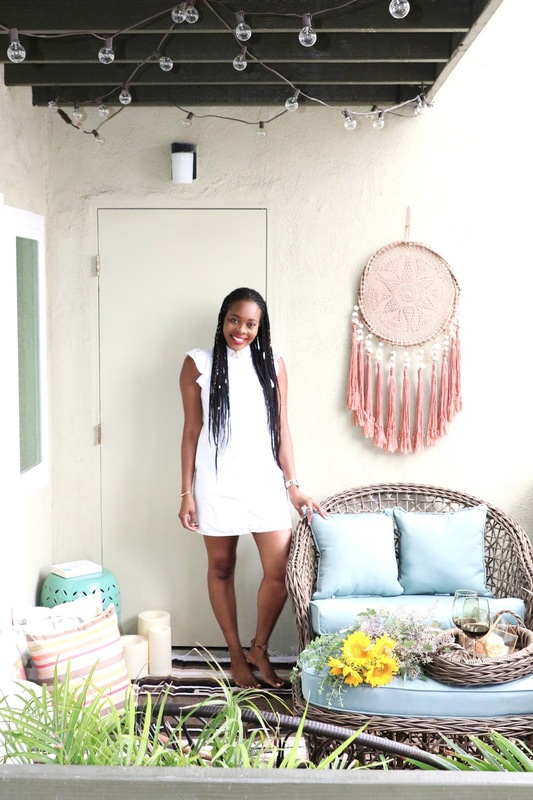 So I love when I see decor that feels eclectic and similar to how I style my home! 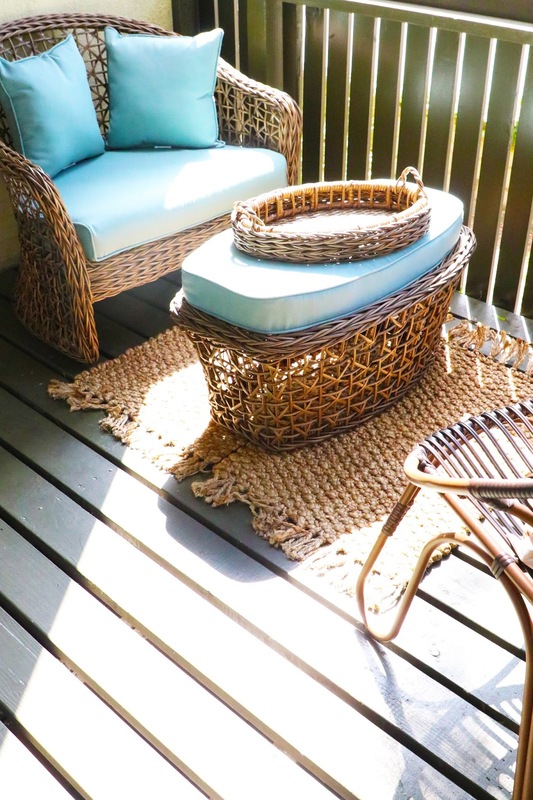 The wicker chair and a half is absolutely gorgeous and immediately caught my eye! My daughter and husband are laying next to me and both said, " oh that's a pretty patio!" This balcony is everything! 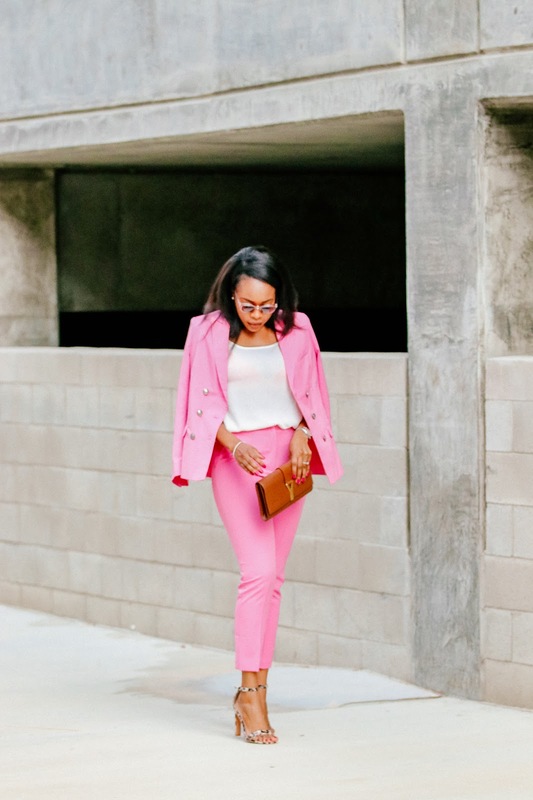 Too fab! 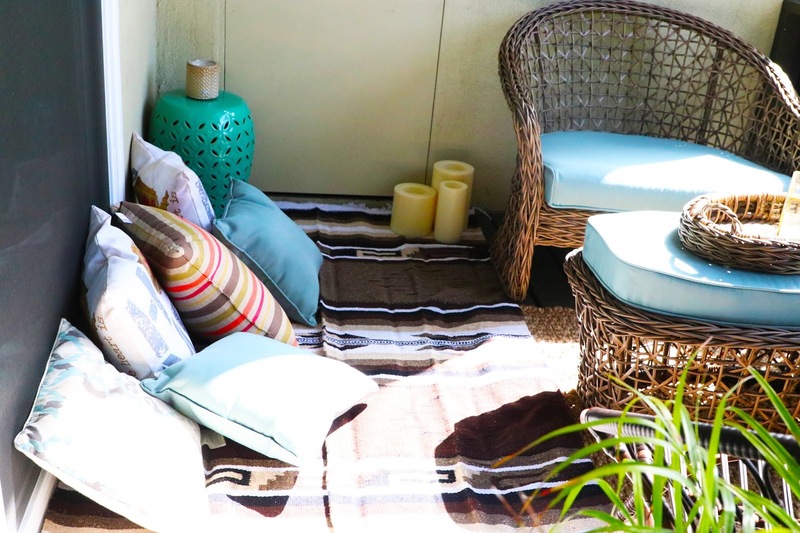 I love what you did with the outdoor space! Nothing better than being outside and enjoying nature! such a beautiful balcony! i love the blue cushions and such cute pillows! 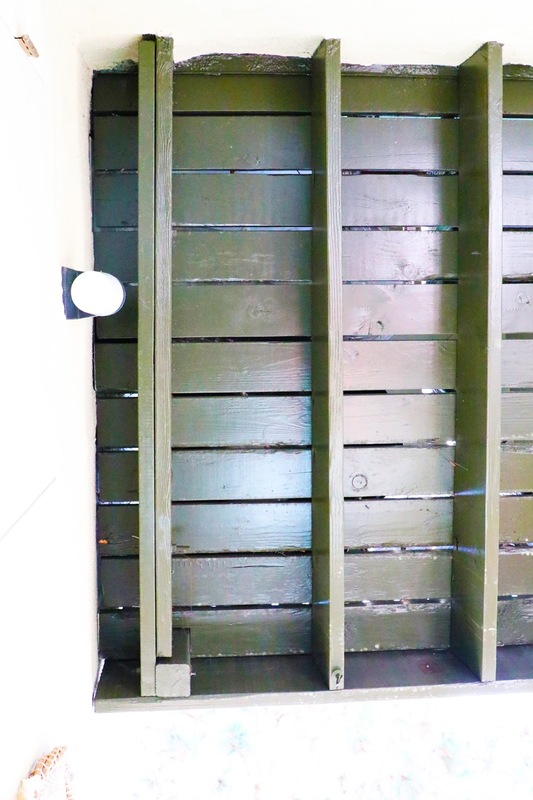 You did such a great job with your balcony! In fact, I love every room I've seen of your house!! Love how you covered all the smallest details, which makes the space look amazing!